Come To My Party are currently hiring! We are looking for reliable, energetic, outgoing, confident and fun performers to join our team! You need to be able to drive and have your own car and have good weekend availability. Regular weekend work and very good rates of pay. This is an ongoing rather than a short term / holiday job as we take bookings a couple of months in advance and the job will require training ( provided!) so please only apply if you have the commitment to offer. 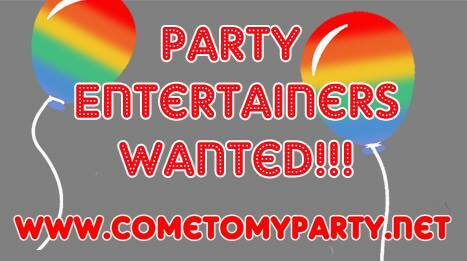 If you are interested please email your details and a recent photograph to info@cometomyparty.net.